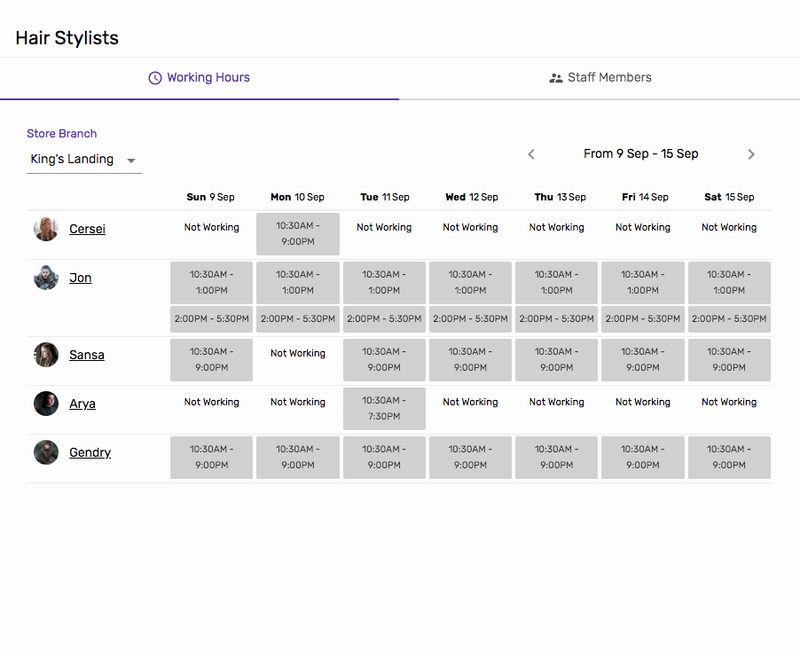 Manage your staff members’ availability, schedules and working shifts with ease. You can also let your staff manage themselves by giving them login access. * could be labelled as “Hair Stylists”, “Barbers”, etc. * Note that if the staff member doesn't have any working hours assigned to them, then customers won't be able to book any appointments with them. Working hours of your staff member determines the availability of bookings slots on your Booking Form. Customers will only able to see the available time slots that they can book. On your staff members page, simply click on the empty block or the time block of the staff member. This brings you to that staff member’s “day working hours” page. Also set the working hours that you’re setting for other days. No Repeat: This working hours only applies to this date. This is particularly useful for special working hours, holidays, personal leave, etc. Available means staff member will be working on that day. Set the working hours for the day by setting the “Start” and “End” of the working shifts. You can also add multiple shifts for a day. Lets say: 10am to 12pm, 2pm to 6pm. Which means that staff member is only available to accept appointment from 10 am to 12pm, and 2pm to 6pm, but not available from 12pm to 2pm. Click “OK” or the ✓ button to save. This is useful when the staff member has a special working hours on a specific day, say come in later, or stay longer, sick leave, holiday, etc. They only happen occasionally, and you don’t want to break their normal working shifts, but only for one day. Same as the steps above, but select “No Repeat” at Step 2. You’ll see there are in the “Working Hours” view, specific working hour blocks are in different colors. Navigate to different weeks by selecting the viewing week at the top. 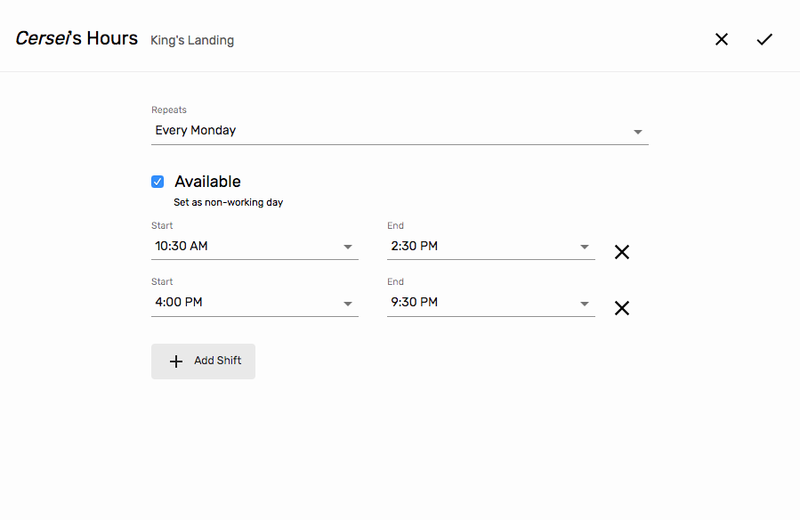 If your store has multiple branches, use the dropdown to view and manage the working hours of different staff members at different locations. If you see the same staff members, means they are assigned to multiple branches. If you see the same staff members have time blocks assigned on the same day, means they are available at the different branch, on the same day. In most cases, you might not want that. Generally, your staff will only be working at one location on the same day.